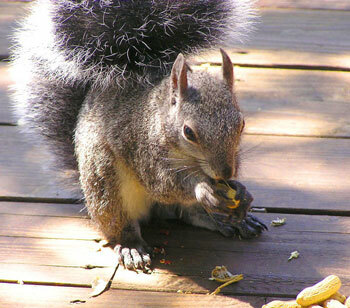 Squirrels Feeders: Which One Is Right For You? Squirrels have definitely become the enemy to a lot of people: not only are squirrels an annoyance to gardeners by digging up all of their bulbs and eating them, but they are an annoyance at the bird feeder as well when they are trying to get some food there. That is why companies started coming out with all sorts of different squirrel feeders! These specially designed feeders were created to keep the squirrels out of the bird feeder and in their own feeder. Of course, there are many different squirrel feeders available now-a-day and it can be very difficult to find just the right one for you. First, you need to decide exactly where you are going to put your squirrel feeder. There are many feeders that mount to trees or a side of the house, but if you want one that hangs, that can pose a challenge. After you have decided where you want to put your squirrel feeder, you now need to decide what type of feeder you want to get. The majority of squirrel feeders are going to be mounted feeders as squirrels have to be in one spot in order to eat their food. There are some hanging feeders though and that usually just consists of a dried piece of corn on a chain – which is fine! Squirrels love dried corn on the cob and that is actually one of the most popular squirrel feeders. If you have yourself a mounted squirrel feeder, the corn on the cob feeder is going to be your best option. There are many different kinds of course, first you can get yourself just the standard corn on the cob feeder that mounts on a tree and has sticks in order to mount the corn on the cob or you can get the ‘wind mill’ corn on the cob squirrel feeder. This one actually holds up to five ears of corn and they hang on a wind mill looking device. 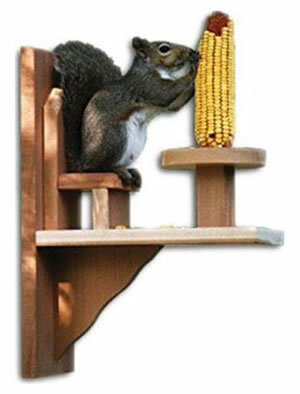 This is a great idea to not only have fun watching the squirrel try to get the corn but also a great way to ensure that many squirrels get to eat! There is also the peanut dispenser. We all know that squirrels love peanuts and if you are looking to really make them happy, why not combine both a corn on the cob feeder and a peanut dispenser! Your squirrels will definitely be in heaven there! You could also make your own feeder. There are several online plans available. Just keep all of these feeders in mind when you are looking to purchase yours and you should have absolutely no problems finding the right squirrel feeder for you!